We may have become a #NewIndia, but the compassion to love and help each other remains intact! Shoukat Ali, a resident of Kashmir, is all praises for the Mumbai Police, after a senior inspector from Charkop police station helped him claim provident fund (PF) that was stuck at the PF office in Kandivali since March. Ali used to work for a private company in Kashmir in 2013, however, could not visit his firm’s head office in Mumbai or the PF office in Kandivali owing to financial constraints. Moreover, he was in need of the money to pay for his daughter’s school fees. Ali’s efforts to reach the officials at the PF office over the phone to check for updates regarding the clearance of Rs 52,000, failed even after trying more than a month. He was also not very tech-savvy to fill up the claim form online, which further delayed the process. The poor speed and impromptu shutdowns of internet service in the valley only added to his woes. After numerous failed attempts to contact the PF office, Ali searched for ‘Mumbai Police’ online and found the number of Charkop police station, which is located near the PF office. He called on the landline and spoke to senior inspector Hemant Sawant, as per a report by Hindustan Times. After listening to Ali’s problem, Sawant decided to help him, which was surely beyond the scope of his duty. He personally visited the PF office to get an update for Ali. Later, Sawant couriered a form to Kashmir and called the claimant to explain the reasons behind the delay in releasing the money. Ali filled the form and sent it back to Sawant, who later submitted it at the PF office. Sawant in all modesty said he was glad that he could help Ali. Twitter handle of Mumbai Police proudly shared this gesture of Sr. PI Hemant Sawant. This is not the first time Mumbai Police has been ushered with compliments for going beyond their call of duty. In May last year, in a nail-biting chain of events, Urmila Kirdat, another Mumbai cop had gone all out to help a family, even breaking the law and going beyond protocol. 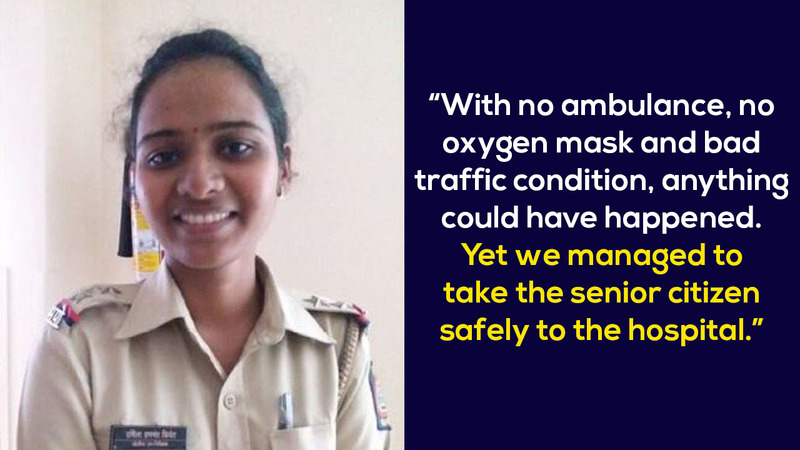 She had set an example of selflessness, to save a senior citizen’s life. With three constables including the driver, Kirdat rode a van with a 90-year-old citizen, to get him to Breach Candy Hospital. Since the police van wasn’t an ambulance and there was no oxygen mask, the team reached Breach Candy hospital from Dadar in 15 minutes. This extraordinary feat was achieved, thanks to Kirdat. When the van ran into heavy traffic at Mumbai Central, the brave cop decided to drive in the opposing lane to move faster. She and the constables kept communicating with traffic police authorities, urging them to clear the streets. The result was that the senior citizen reached Breach Candy Hospital, and received the medical care he required. His niece was full of gratitude and praised the police for their timely action. On one end, many a times, we citizens don’t miss any opportunity to mock the police, however, these human gestures cannot be forgotten. Previous articleWorld Cup 2019 India Squad Announced : Can they repeat ’83 at the Lords?